Interests:My interests are writing my novel, listening to music. having fun. watching horror movies, and I love the writings of the mastermind Stephen King. Greetings all, My name is Liz and I am from Australia.. I am pretty new to this site so bare with me. I am currently writing a crime novel. I am pretty serious about. I have been accepted by Raiders International. I have not signed the contract on the dotted line.. I am looking at all avenues, and I want to make my book the best it can be. I have a facebook page about my book and I also have put my first chapter on my website I have just recently created. for those of you that are interested in reading it, or just want to have a chat and tell me whats what then inbox me.. I hope you are all well. here is my facebook page regarding my book. This link is my new website, i have one chapter put up there as a sneak preview. 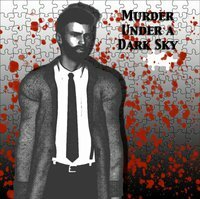 "http://murderunderadarksky.weebly.com/"
There's nothing wrong with posting a link to your site in the forum. I'm sure there are plenty of people (including myself) who would like to see your crime novel manuscript. Thank you for the advice, its done.. I am just trying to get good word of mouth going up there. Understood. And you're welcome, Ms Blade.